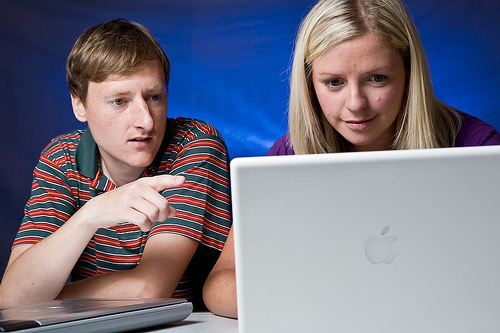 The nature of Continuing Professional Development is changing in schools from the one day course chosen from a booklet or website to teachers engaging in their own research. This research may be undertaken as part of the National Professional Qualification for Senior/Middle Leader, as part of an extended leadership programme – for example, the SSAT Aspiring Senior Leaders Programme – or the more traditional Masters qualification. 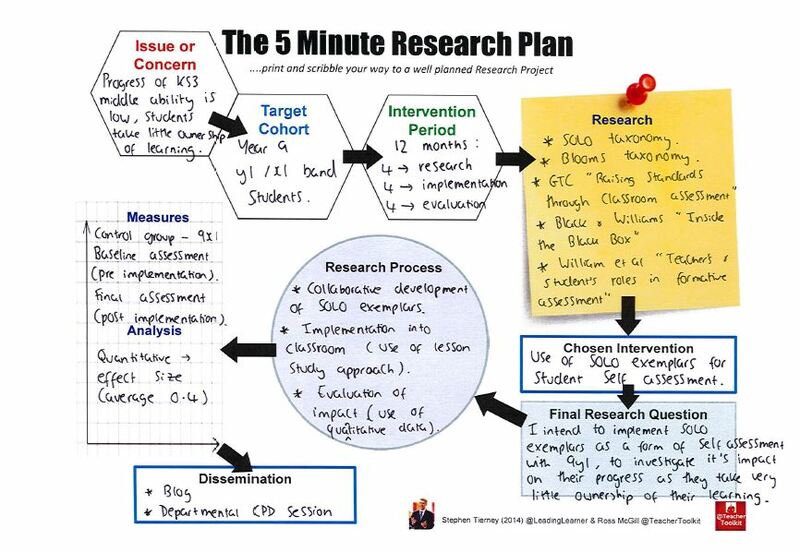 The #5MinResearchPlan has been developed by @LeadingLearner & @TeacherToolkit to help teachers organise and maximise the impact of their work. 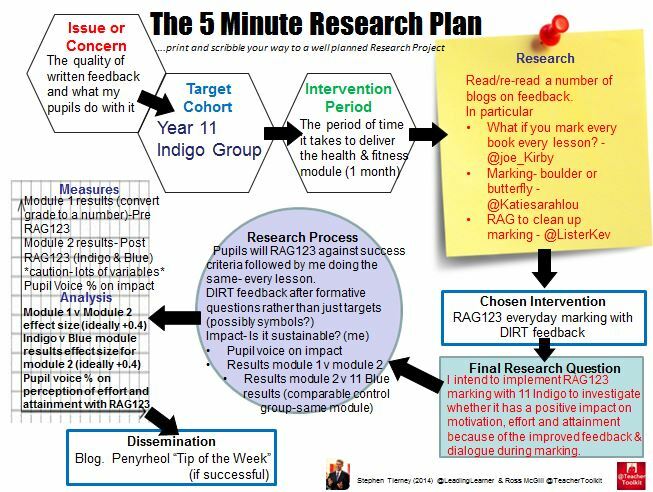 The #5MinResearchPlan is very much a beginners guide and hopefully a useful tool to help you produce an outline for your research and to help order your thoughts. 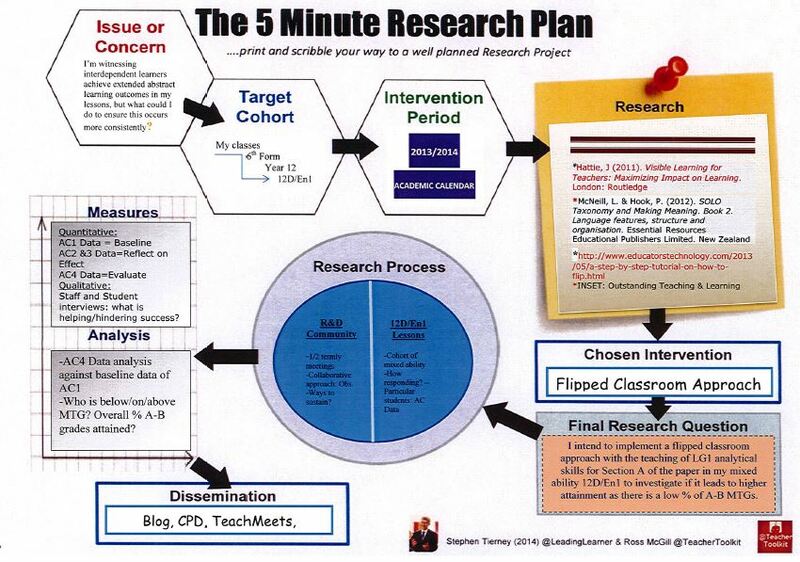 If you are engaged in high level research you may need a little more than a #5MinPlan. We are both grateful to David Weston and Bridget Clay of the Teacher Development Trust for their thoughts and suggestions in producing this plan. The Teacher Development Trust is a charity that is dedicated to improving the educational outcomes for children by raising the quality of teacher professional development. Its work through the National Teacher Enquiry Network is doing some fascinating work around the country. If you are serious about the professional development of teachers you should apply to become a member of the network. What is going quite well that I would like to go even better? What is really a problem and needs to improve? It is important to narrow this down as it is unlikely to be all classes and all students. Well actually it is really the Year 9 classes. What all students in Year 9 classes? No, it seems to be a group of boys in my Year 9 middle ability class. You have started the important process of narrowing down the research focus to a small manageable cohort that you are particularly interested in. There is no hard or fast rule for the period the intervention will run for. Typically projects, including for some involving external accreditation, run for between six to twelve months. This includes the initial research, implementation of a particular programme and writing up the findings. A good rule of thumb is to think about allocating times in thirds. So for a six month programme, there would be two months for initial research, two months for implementation and two months for writing up. This can be one of the really interesting and fun elements of the programme. What different ideas can you find about possible ways to impact on the particular issue or concern you want to address? Keep a note of the key ideas that are of interest to you. The research can be from the academic – research books and papers; alternatively it could be from a course or INSET day, blogs or other schools or simply ideas from and discussions with colleagues about what they are doing. As you intend to disseminate the research it is important to keep a note of the different sources you have got the ideas from and reference them in your final write up. A good tool for referencing sources is Neil’s Toolbox: Harvard Style Reference Generator. Having done your research it is important to narrow down all the options to a chosen intervention. It may be you have a number of different interventions that you are interested in and quite excited about. It is important to be disciplined. Just implement one at a time and see the impact before looking at another one. 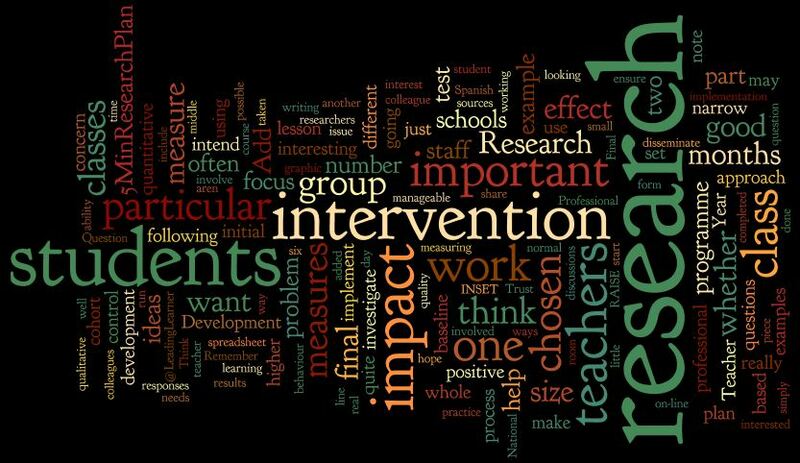 I/We intend to implement <chosen intervention> with <chosen pupil cohort, subject & topic> to investigate whether it has <add impact you hope to achieve> because <state your reasons>. 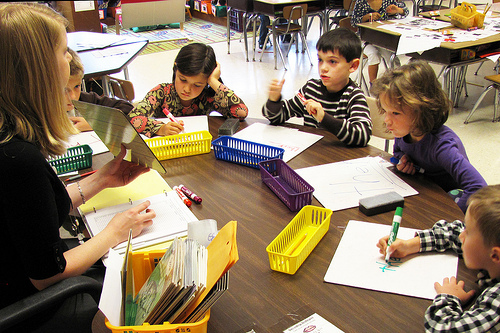 Is the intervention classroom based or outside of normal lesson time? Will you be the sole person involved in the research project or is it a collaborative approach in terms of planning, implementing and evaluating? What measures are you using? 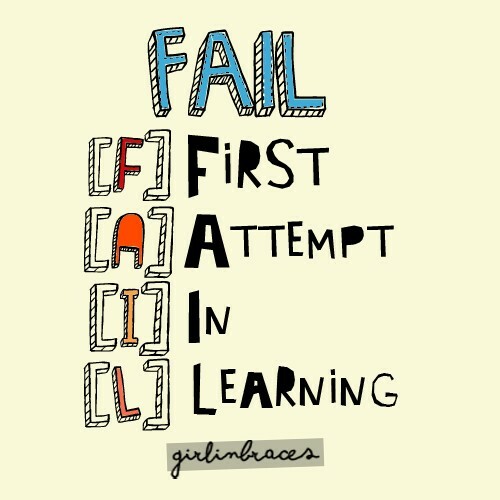 This can be one of the most difficult parts of the research plan for teachers. Sometimes people set off without a clear idea of what they want to measure or how it could be measured. Instead of an interesting piece of research you’ll end up with a nice little anecdote that lacks the depth required. Think about whether your measures are going to be quantitative (numbers based) or more qualitative (descriptions or discussions). It is not unusual to measure both but you must ensure that your measures are reasonable and manageable alongside the other work you have to do. 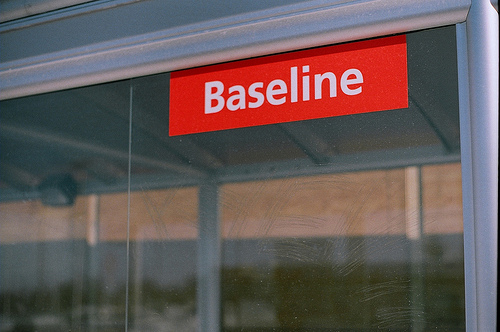 Remember to get a baseline measure before you start the intervention. Some examples of quantitative measures are tests and examinations (don’t be afraid to use the same one as the baseline and final assessment), tally charts recording behaviours or incidents you want to measure (e.g. shouting out in class) or surveys (for example student voice responses to particular questions). More qualitative measures would involve direct observations by a colleague just describing what s/he saw in a particular lesson or interviews with students. Care needs to be taken here to ensure there is a particular area or set of areas you want the colleague to focus on. The same is true when devising questions to use when interviewing students. These records can be very useful in identifying reoccurring themes or responses which will help you determine whether the chosen intervention is having an impact. The final thing to think about is whether you will include a control group in your analysis. This is considered good practice in research. The control group will have all the same measures taken but there will be no intervention with this group. This can sometimes cause a bit of a “moral dilemma” for teachers as they feel they are denying one group a potentially positive experience that another group is having. Another way to think about this is that until you are sure that your chosen intervention does have a positive impact it would be too risky to involve a higher number of students. If the chosen intervention does have a positive impact then it will be shared and spread so all students may benefit from it. One form of quantitative measure is using effect size which is often used by researchers. An average effect size is 0.4 and so researchers are often looking for 0.4 or higher when measuring the impact of a particular intervention. Below is an example of measuring effect size. 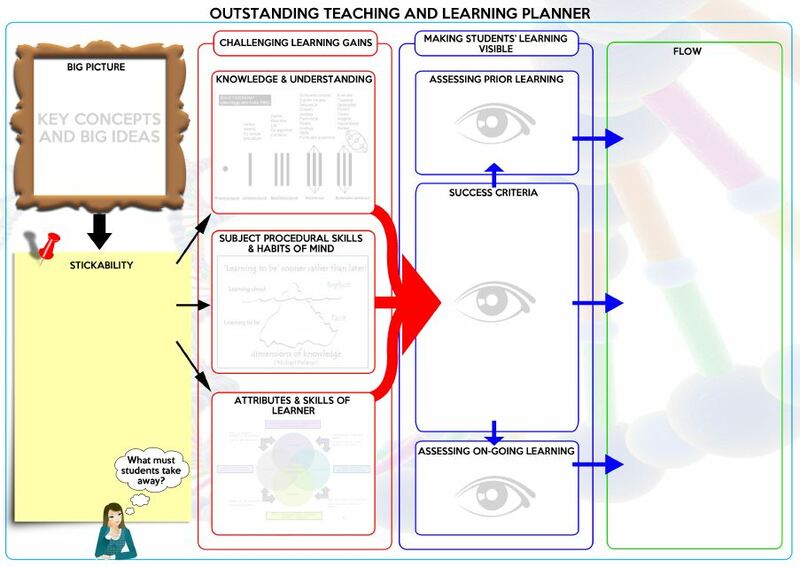 It was completed as part of an INSET Day when working with a whole staff on Outstanding Teaching & Learning. All teachers did a simple on-line multiple choice test consisting of ten Spanish language questions. With the help resources from the Head of Modern Foreign Languages (thanks Sam) I taught a thirty minute Spanish lesson having analysed where the most common mistakes where. The staff then redid the on-line test. Increasingly the action research work completed by teachers in the classroom will form part of the wide body of evidence that will influence what happens in schools. With the proliferation of blogging, a trend that is likely to continue, it is possible for teachers to make their work available to an international audience. A number of schools are sharing teacher-led research through in-house magazines, TeachMeets or market places as well as staff or departmental meetings. Don’t underestimate the interest from colleagues in the work you have done and also in the process you went through to gather your finding. 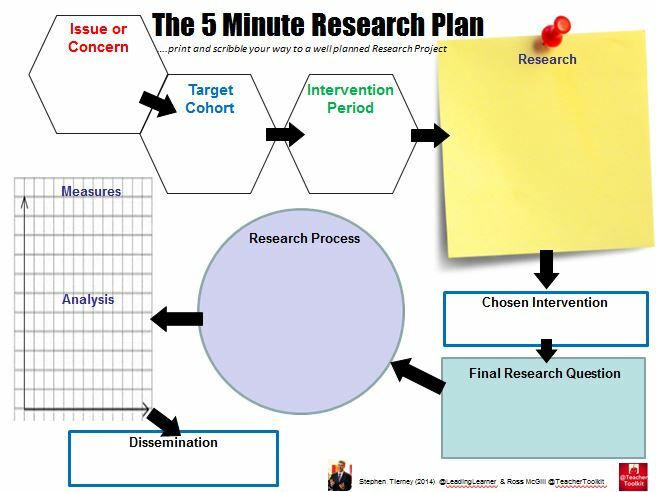 It is important for you to consider the best way to disseminate your work and include this within the #5MinResearchPlan. 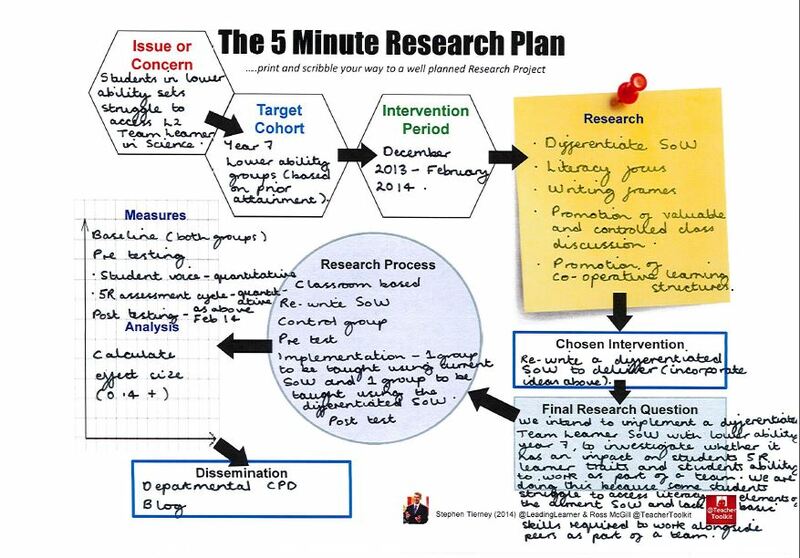 The first completed blog report on the #5MinResearchPlan was completed by Damian (@Benneypenyrheol) “The #5MinResearchPlan on #123 RAG Marking”. Well worth having a look. Another excellent blog full of good ideas. I have a few things I want to implement/tweak and may well use this to plan it out and take a baseline reading to then compare outcomes against. I might fill one in “retrospectively” for my RAG123 marking experiment so I have a record of the strategy and the outcomes. The idea of doing some research and making a focused tweak/change to see if there is an improvement is an exciting one. This is an admirable attempt to demystify education research. Your explanations of the processes are sound but I worry about giving the impression that something so inherently complex is either quick or easy. Maybe it’s preferable to encourage as many teachers as possible to have a punt, but the possibility is that it could lead to some wrong headed, erroneous conclusions being drawn and disseminated as fact supported by ‘evidence’. It’s no coincidence that a masters programme in social science would start with a unit on research methodology: there are a whole heap of potential pitfalls to be avoided and issues to consider. Are these hollow concerns? Am I being overly cautious? “Are these hollow concerns?” – NO “Am I being overly cautious?” – YES. “This is an admirable attempt to demystify education research.” – SPOT ON. I share an aversion to anything that claims to be a ’5-Minute…’ solution, along with the ‘Five most important…’ and ‘Top ten list of…’. Trivial and transatlantic they may be, but the reality is that if they reach teachers who would otherwise not be engaged, I’ll live with them. “What do we need?” “We need more educational research!” When do we need it? NOW! All social science research is fraught with potential pitfalls – but the best way to address them is to actually engage with a specific research project and hone one’s skills. Sure it will be hard work, but it will be rewarding, and like all skills, research skills only improve with practice. Check out research methodology to avoid basic mistakes, then go for it. Get friends as critical reviewers to keep you from major blunders. And rely on a whole profession to point out any ‘wrong-headed erroneous conclusions being drawn and disseminated’ when you present it as evidence. The profession needs to upskill itself in educational research. Now is not the time for quibbles and caution, but robust debate and action. “What do we need?” “We need more educational research!” When do we need it? NOW! I agree Tony. Good to hear your comments. 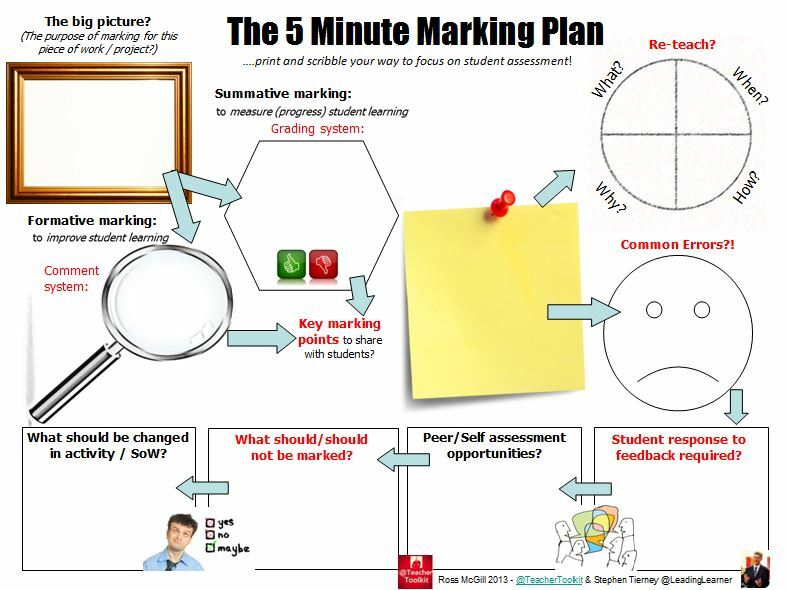 I do fear the 5 min plan has been overdone; remove the word ‘5 minutes’ and you are left a template that serves as a good overview on a page, for educ-research. 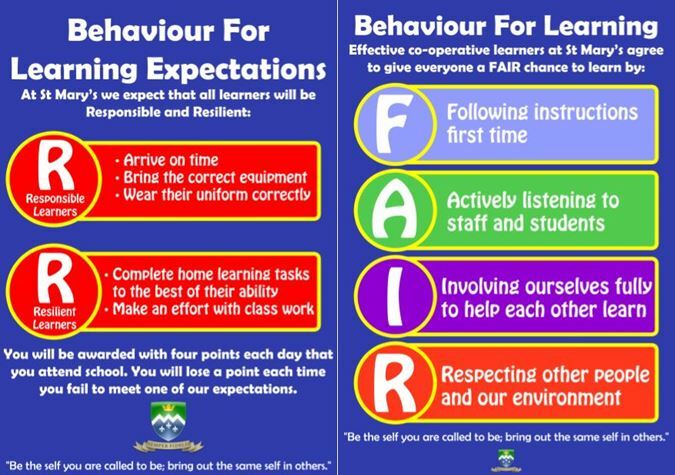 Many, many schools are far, far behind on this! It is odd that some teachers seem to respond to quick and easy fixes over complex, long term engagement, should we model what we expect from our students more or are we used to getting them to respond to quick and easy too? Thanks … I think … maybe I need to think about this comment a bit more! I agree. 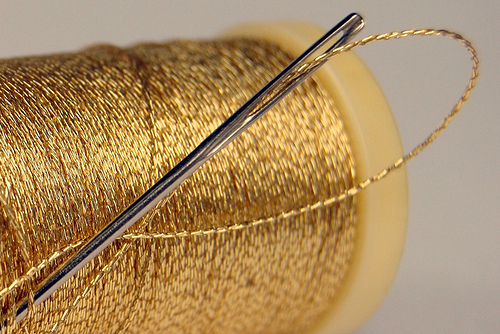 We are too keen to allow students a quick-fix in theri learning. As teachers, we do this too. Time constraints and the pseudo-culture of targets and goalpostshifters do not encourage teachers to take time over their own development. Anything that suggests a quick win; reduction in time; money and bureaucracy seems to be a winner for most – this is not how it should be! We did try to give a bit of a health warning with this one, “If you are engaged in high level research you may need a little more than a #5MinPlan”. It’s a bit like Tony has suggested below, there needs to be an entry level for teachers that doesn’t overwhelm them but allows them in a structured manner to start looking at the impact of what they do in the class room. 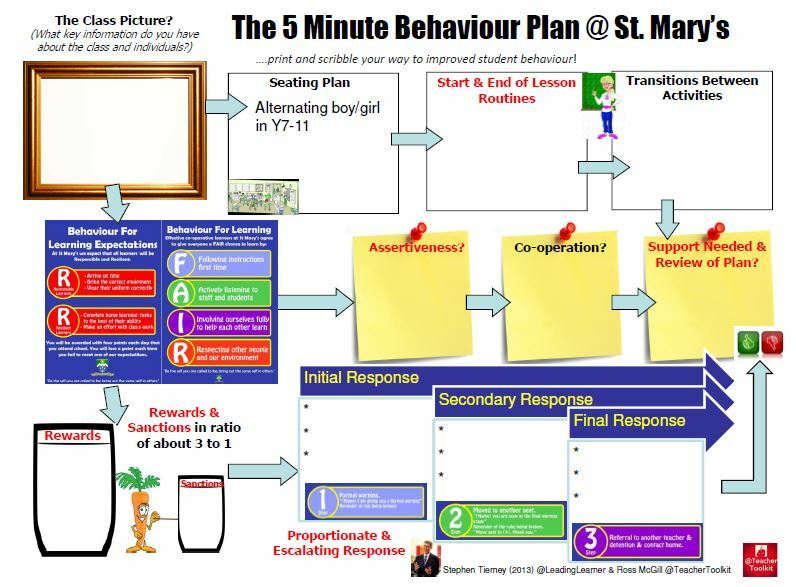 All the #5MinPlans I’ve produced with Ross have had quite a bit of work and thinking behind the scenes but the style of presentation very much gives an overview/structure. They are offered for teachers to use if they find them useful or ignore if they are not useful/already have their own structured way of approaching things. The idea about greater engagement with universities is spot on. I’d love to see this as part of university’s work and they would take people’s understanding way beyond the process above … but the plan above is structured, some will find it useful and it will hopefully be a start of a way of working for many teachers that is currently not yet part of their repertoire. What I like best about the format is it might simply encourage colleagues to search for a solution to a problem and implement it rather than just living with it. Of course when it comes analysis and dissemination we all need to be aware that there are always many, many variables at play. I agree totally with Martin’s point that colleagues will point out any errors during dissemination. We are a canny enough profession. I think the more teachers that give this sort of thing a go (using whatever format of course) is hugely preferable. Educational research is inherently complex but that doesn’t mean we shouldn’t strive to undertake it as part of professional development. Many interesting comments here. I agree that anything that smacks of ‘airport lounge’ books does seem to be looked down upon by both academia and professionals, often for very good reasons. However, I applaud any attempt to help teachers engage in research. The plan is very much in the tradition of action research/evaluation in schools, and if it helps class teachers to identify a discrete subject to research, and then carefully consider the issues, then that can only be useful. I like the layout as a base planner, and I think it could be developed into something more sophisticated in time, perhaps moving away from the ’5 min’ tag. What would probably be helpful to new researchers in schools is to point them in the direction both of useful books they could read, or university professional development work that concentrates on skilling you up research wise. There are dangers, but the more people are aware of them, the better. Look forward to seeing how it develops. Thanks for this useful comments. It would be helpful if you or anyone else reading this would add a link to any useful books on research methods to the comments section that others could consider if they want to develop a greater understanding of research within the class room. A team of us at Cambridge University have written a book for new teachers published by SAGE. It is called School – based research: a guide for education students. I ediited the book ( Elaine Wilson) but it is team effort. Royalites donated to Cancer Research in memory of Jean Rudduck, our late, wonderfully supportive and knowledgeable Professor. Just one comment on the #5MinResearchPlan – would suggest that a section on ‘ethics’ would strengthen it. All too easy for teacher-researchers to make assumptions when researching in their schools and take things for granted and sidestep important considerations of ‘informed consent’ etc. Good suggestion on addition of ethics and thanks for the suggestion of another resource for teachers to use. On looking at this a few times now, I think I am a little unsure on the use of the word “research”. think this is more of an excellent evaluation plan that would help guide a teacher who is trying a new idea and whats to see its impact. To make this a research plan, I feel there needs to be greater consideration to the research design – how his study fits with a multitude of other studies you have done/will do. (see reference suggestions below). Also, what knowledge will this generate, what gap does this study “fit”, what theory does this test? As an evaluatioin plan, it is great – I would add reminders about timescale, ethics (as above) and collaborators. In regards to best research methods books that have the pick up and go factor, this are my top 5. I have picked these ones s they are both value for money and value for impact! Research Design by Stephen Gorard – almost essential for any head who wants to bulid a research-intensive school. Quantitative Methods Made Easy by Stephen Gorard, – same guy as his writing is so accessible. I dare you not to be able to have a good grasp of the fundamentals of quantiative methods after reading this book. Real World Research by Colin Robson – this is my right hand man when writing up any methodology. Takes a pragmatic “real world” view of research without ignoring the importance of research methodology theory. Easy to access yet sufficiently detailed for any research methods. and Elaine Wilson et al’s book on RM in Schools is brilliant – go get it! Thanks for adding this Neil. Fair comment and some good suggestions for further reading.